Joyne, a new multi-channel TV venture for Dutch viewers and the country’s recreational market, has selected the EUTELSAT 9B satellite as its platform to reach viewers in the Netherlands and across Europe. Joyne has signed a multi-year, multi-transponder contract with Eutelsat Communications (NYSE Euronext Paris: ETL) and is preparing to officially launch on 24 July, using Eutelsat’s Paris-Rambouillet teleport for uplink services. The new platform will begin with a diverse mix of pay and free-to-air (FTA) channels with a strong accent on sport. The platform will feature 30 well-known Dutch and international channel brands that include Fox Sports HD channels and Discovery Networks Benelux. Using the pan-European beam on EUTELSAT 9B, viewers will be able to receive the DTH service with Conax Contego Cam cards and dishes starting from 45cm. They will also be able to tap into content at adjacent video neighborhoods. 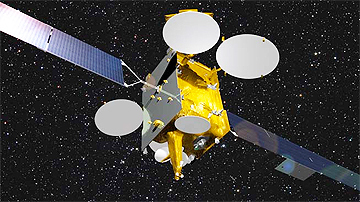 Artistic rendition of the EUTELSAT 9B satellite. The monthly subscription option, which gives subscribers access to the full suite of Joyne programming, will be available from 13 euros per month. Joyne’s competitive proposition is also based on flexible short-term subscriptions, from one month, for Dutch viewers with second homes and mobile homes as well as special offers for public spaces in camping sites and bars. Hans Brunas, CEO of Joyne, said that the new Joyne brand stands for connection and the pleasure afforded by quality entertainment. This new proposition will be distinctive for TV quality, broad reception across Europe and flexibility in subscriptions. This was a logical choice to select Eutelsat as the company's satellite platform. Michel Azibert, Chief Commercial and Development Officer of Eutelsat, added that this new contract with Joyne on EUTELSAT 9B reflects the efficiency of satellites for targeting language communities and for extending access to premium pay-TV content for the many viewers who want short-term seasonal solutions. This marks the first step in a partnership with a new European player that places exceptional flexibility at its core.